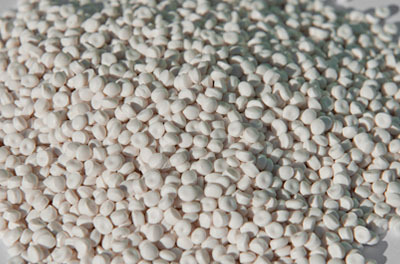 Pelletized masterbatches with actives substances and virgin polyolefins (PE, PP), for the thermoplastics industries. Additive masterbatches (MB) are used to modify polymers’ characteristics during but also after processing, giving to materials some specific properties. They have a low level of active substances and are classified in various families according to their purposes. Processing aid MB (eg PPA 5) creates a coating on the machines’ metallic walls to prevent the melt fracture. They reduce die deposits as well as the “shark skin” effect. Slipping MB (eg SE 5) are migrating agents for a thin lubrication surface layer allowing smooth handling of the manufactured product. Fast or slow migration agents are available. Antioxidant MB (eg AO 1) are based on phenolic and/or phosphite chemical substances, they prevent the degradation of polymers during their processing but also when lines are stopped. Antiblock MB (eg AB SN15) are made of mineral fillers with a very small diameter which modify the surface of manufactured products , especially films, for instance to ease the unwinding of rolls, the opening of bags or to improve ink printability. Multi-purposes MB (eg ABG SN10 E5) combines different properties (for instance antiblock + slip agents). Antistatic MB (eg AS G10) are fast or slow migrating agents moving to the surface of manufactured products to evacuate electrostatic charges. 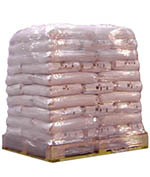 They can also be used as demoulding agents. Thermal MB (eg IR 70) contains some mineral agents for greenhouse films blocking infra-red radiations absorbed by the soil during day and re-emitted at night. Anti-UV MB (eg UV 4525) are made of chemical molecules which can reduce or even inhibit polymers’ degradation exposed to UV radiations. Flame retardant MB (eg FRF 01W) slows down the combustion process and reduces flame propagation. Purging MB (eg EXTRUNET HD) allows cleaning of lines at material changes with no need to stop production. Dessicant MB (eg DSC) are widely used as humidity absorber during processing of virgin polymers and recycled material. 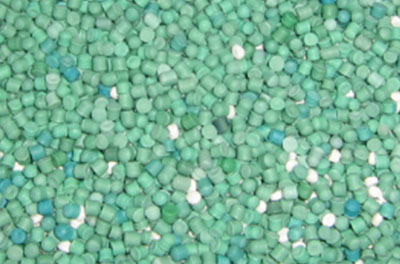 Pelletized masterbatches and compounds with talc (from 70% to 75%) and virgin polymers (PE, PP, PS), for the Extrusion, Thermoforming and Injection industries. 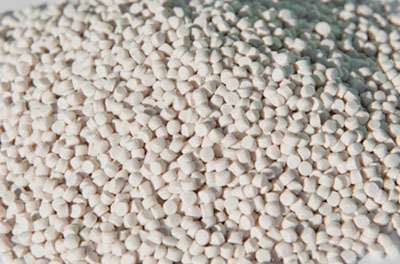 Pelletized masterbatches and compounds with calcium carbonate (from 70 to 82%) and virgin polymers (PE, PP, PS), for the Extrusion, Thermoforming and Injection industries. Re-granulation of industrial post-production plastic waste (HDPE, LDPE, PP, EVOH/PS), for a second use in the Extrusion, Injection and Thermoforming industries.